*These windows were extended by the State Examinations Commissions in a circular at the end of 2018. 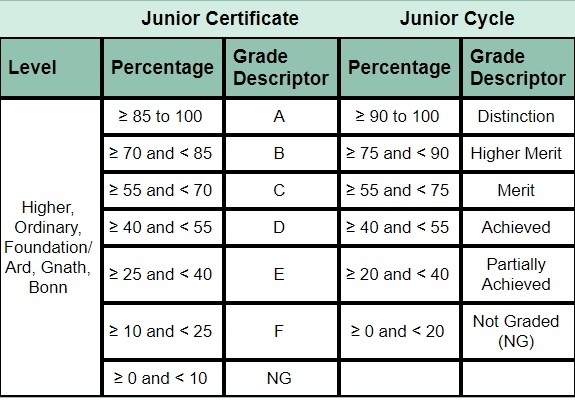 The new grade system for Junior Cycle written exams is as given below. As the New Junior Cycle is phased in students will have a mixture of ‘old’ (Junior Certificate) and ‘new’ (Junior Cycle) grades on their JCPA. Classroom Based Assessments (CBAs) provide students with opportunities to demonstrate their learning and skills in ways not possible in a pen and paper examination, for example, their verbal communication and investigation skills. CBAs will be undertaken in subjects and short courses and will be facilitated by the classroom teacher. They will be undertaken during a defined time period within normal class contact time and to a national timetable. Students will complete one CBA in second year and one in third year in most subjects. Exceptional describes a piece of work that reflects all of the Features of Quality for the Classroom Based Assessment to a very high standard. While not necessarily perfect, the strengths of the work far outstrip its flaws, which are minor. Suggestions for improvement are easily addressable by the student. Above expectations describes a piece of work that reflects the Features of Quality for the Classroom Based Assessment very well. The student shows a clear appreciation of purpose and register, and the work is praised for its consistency. Feedback from the teacher might point to the necessity to address some aspect of the work in need of further attention or polishing, but, on the whole the work is of a high standard. Yet to meet expectations describes a piece of work that falls someway short of the demands of the Classroom-Based Assessment and its associated Features of Quality. Perhaps the student has made a good attempt, but the task has not been grasped clearly or is marred by significant lapses. Feedback will draw attention to fundamental errors that need to be addressed.